Whether or not it's LG's new flagship is another question. After revealing an AI-powered version of its late-2017 flagship, LG seemed to be having a quiet MWC. As it turns out, the real action was happening elsewhere. Israeli news site YNET posted a brief hands-on of a smartphone called the G7 (NEO) that appears to pack a Qualcomm 845 chipset and a 6-inch, 19.5:9 OLED screen with a notch carved into the top. YNET's report further suggests the device could come with either 4GB of RAM and 64GB of storage, or 6GB of RAM and 128GB of storage, as well as a 16-megapixel dual camera. Given its name and its apparent horsepower, this just might be the new flagship phone LG was planning to reveal after MWC, though the company stopped well short of confirming that. An LG spokesperson told Engadget that the phone in question was a "concept," and that LG never had this particular device at its main MWC booth. (That sadly means we couldn't talk our way into some hands-on time of our own.) That spokesperson also added that "carriers and business partners always get to see early concepts" at trade shows like this one, which may indicate LG is trying to firm up its sales channel partners ahead of an upcoming announcement and launch. Had LG shown this device off at MWC proper, it would've been in good company. Quite a few smartphone makers embraced notched screen designs this year. While some are relative unknowns -- like Noa and Leagoo -- ASUS notably paired a notched display of its own with a Snapdragon 845 in its new Zenfone 5Z. Like it or not, it looks like 2018 is going to be the year of the notch. 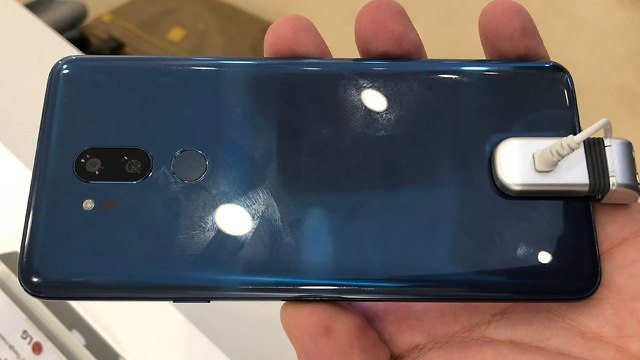 Given the G7's concept status, though, it's possible LG may not join the notch club after all. VentureBeat's Evan Blass noted in a tweet that this might be a version of the G7 that was ultimately scrapped in favor of the "Judy" design and its super bright, low power display. If the rumors hold true, the Judy flagship will be announced sometime in June -- looks like we won't have to wait too long to start getting some actual answers.